Five summer lunches coming at you right…NOW! On Monday, Augie had blue and white goldfish crackers, strawberries, carrots, sugar snap peas and meatballs from the freezer. 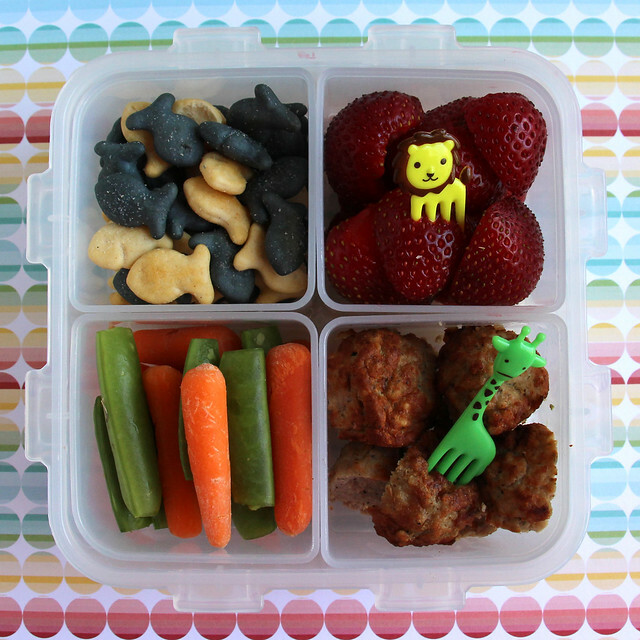 I included cute little lion and giraffe forks to use to eat the berries and meatballs too. This was packed in our Lock & Lock bento box. My kids have been obsessed with peanut butter and jelly sandwiches this week and Augie specifically requested that I put some in this lunch. I used the star shape in my new Snoopy cutter set and stamped a couple profiles of Snoopy on there for decoration too. I also packed nectarine chunks with a dog pick, strawberries, cucumber slices, a small Snoopy cup filled with hummus and a few sugar snap peas to fill the last bit of space. 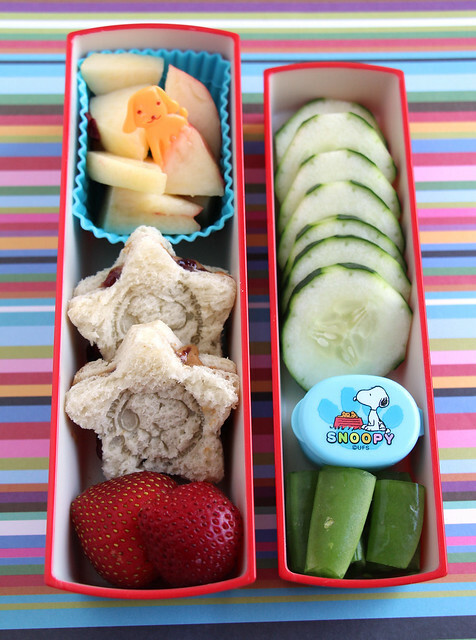 This went to school in our super cute London bus bento box. Yumbox day! 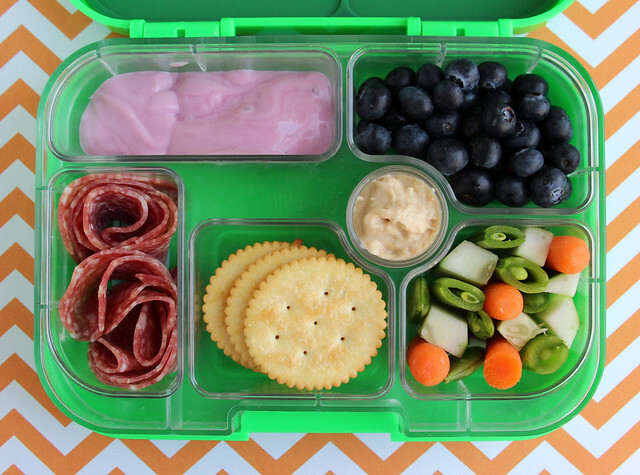 I was running late so I kept this one super simple: yogurt, blueberries, salami, crackers, hummus and mix of carrots, snap peas and cucumber sticks standing on end. 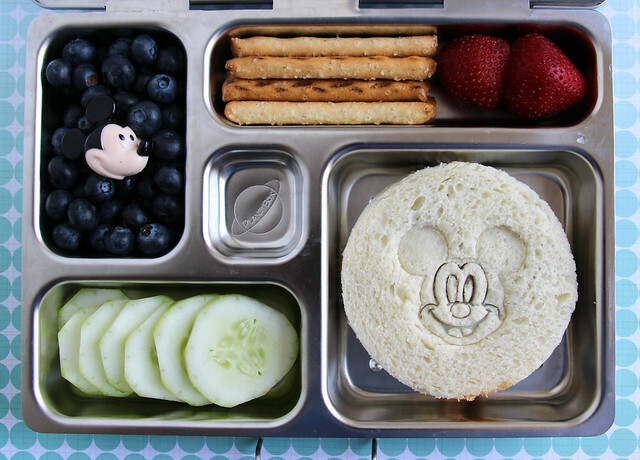 We went with a Mickey Mouse PlanetBox on Thursday: blueberries with a Mickey ring, cucumber slices, whole wheat pretzel sticks, a couple strawberries and a peanut butter and jelly sandwich. To make the sandwich, I cut the bread out using the larger container that comes with the PlanetBox . Then I stamped the Mickey face using one of our Mickey Mouse cutters . After I used the stamp I realized that Mickey’s face wasn’t outlined, so I got the outer cutter and gently pressed it into the bread to give the face a little more definition. Then I filled the bread with peanut butter and jelly and put the two slices together to finish it off. Today I pulled the PlanetBox out of the dishwasher and used it again. 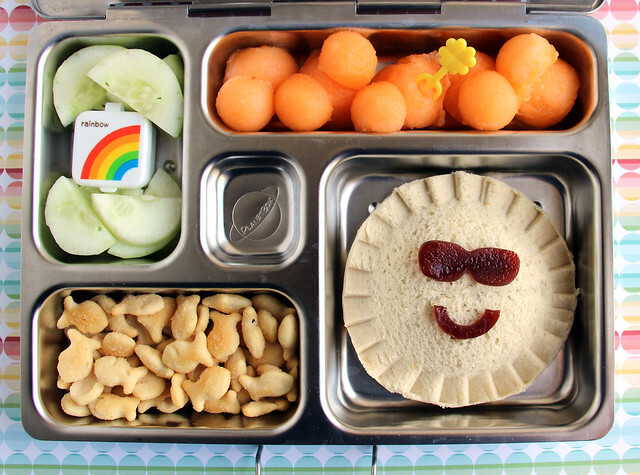 This lunch is meant to evoke a fun, sunshiney day: cucumber slices with hummus in a rainbow box, cantaloupe balls with a little fork pick for eating (it’s a clover, but I thought it looked a little like a sun so I told Augie that’s what it was), white cheddar goldfish and a sealed peanut butter and jelly sunshine sandwich. I made this sandwich with a pie mold and then added sunglasses and a smile cut from fruit leather using this cutter set.